POVCOMP 2004: Viewing Page for "Waiting for the relief"
This is a attempt to model the "La Jument" lighthouse some miles offshore of Brittany (western France). I wanted to recreate that illumination we can see after a gale when sunlight hits the foreground while background is darkened by a cloud. This scene was made mainly in Moray, using native features and Luis Gomes' InsertCode plugin which allows to enter POV-Ray SDL code while in Moray workspace. 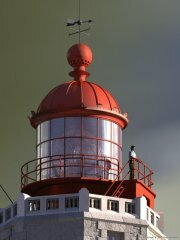 1stly I modeled the lighthouse after photographs found on the web. walls, corner and windows stones are isosurfaces and CSG with isosurfaces. The lightcage, optics and surroundings are CSG. The rusted handrail is made of prisms (posts) and spheres (rails) placed along a spline by 2 loops. The man is a basic Poser character. The cloud is a simple transparent box containing a scattering media with a df3 density file generated by Gilles Tran's Makeckloud macro. The sea (the timehog of this image) is an isosurface with a blend of unevenly scaled bozo pattern for the swell and f_ridged_mf function for the choppy waves. 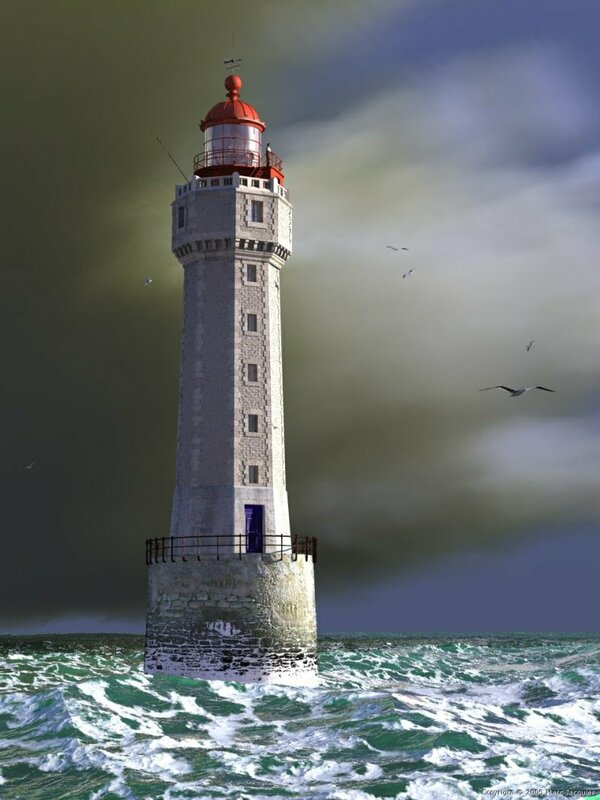 The foam is a texture from a function which fills a crackle more or less depending on the distance to the lighthouse base. Free water surface is fully transparent. Color comes from an interior with a redish absorption_color and scattering_color. Great mood and lighting. Liked the use of CSG, the positioning of the birds, picture had a lot of depth to it. 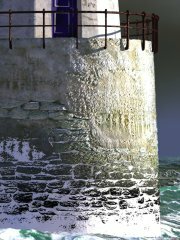 The water was done well, the only issue I had with this one was that the lighthouse didn't quite look like it was "in" the water. The edge seemed a bit abrupt, perhaps it could have used a bit of spray or something similar to break the lines up. Great work otherwise.